Kelly McAndrew and Tracy Middendorf in Abundance. Photo by Marielle Solan. 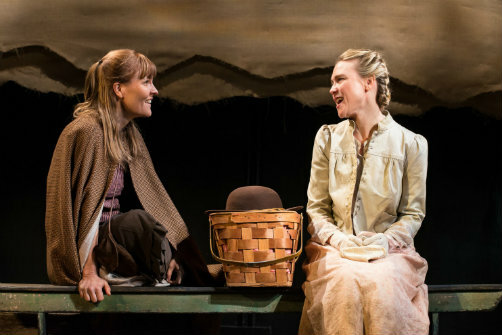 BOTTOM LINE: A strong ensemble vividly portrays the pull and peril of female friendship in the unchartered Old West over a quarter century in this fact-based revival. An unlikely bond is formed when mail-order brides Bess Johnson (Tracy Middendorf) and Macon Hill (Kelly McAndrew) meet while awaiting the arrivals of their promised husbands. They are physical and emotional opposites. Bess is blonde, with a gentle, quiet way about her while Macon, brunette and built for physical challenges, is ready for adventure, concerned only that the men not be ugly. 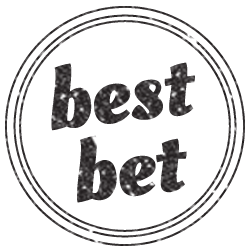 Penniless, Bess has been left stranded for days because the sweet-sounding man whose letters she’s been holding onto hasn’t turned up, and happily accepts Macon’s offering of biscuits and eager kinship. As Macon, McAndrew is a bundle of energy and enthusiasm and brings a needed dose of levity and spark to the early scenes after Bess’s betrothed turns out to have died and his brother Jack (Todd Lawson) finally comes for Bess to announce that she will marry him instead. Shocked and saddened, she bursts into tears, something Jack, in a sign of things to come, forbids, as he takes her back to his impoverished homestead. Middendorf has the greater challenge as Bess endures Jack’s cruelty and continues to try to please him no matter how much of a brute he is (Jack won’t allow her to sing, which she loves, and accuses her of trying to kill him with cornbread, which killed his brother). Lawson makes the most of his unredeemable villain. Macon fares considerably better with Will (Ted Koch), who has lost an eye but compensates with kindness and is intent on trying to make her happy. He gives her a ring, though it is the one that, she notes with displeasure, belonged to his late wife. Will tells her that he’s saving up for a glass eye, an effort he hopes she appreciates. Koch brings tenderness to his portrayal that made me think of the “Mr. Cellophane” number from Chicago. It’s during the second act, when the households undergo various reversals, that the drama truly takes flight. After Bess is kidnapped by the Oglala tribe on the night of the couples’s fourth wedding anniversary and presumed dead for five years, a tattooed and scalped Bess is “rescued.” Leaving behind a husband and two children, she is traded to the Americans for little more than “blankets and bullets” as she bitterly describes the betrayal. She had found some semblance of peace, and more importantly, a sense of self and her own power. Macon and Will, who had prospered during the early years of their marriage while Bess and Jack had nearly starved, are quickly going bankrupt. Bess seeks to punish both her new family and old, having correctly sensed something brewing between Macon and Jack the night she was taken. Aided by a professor (Jeff Talbott) who wants to exploit her story for a book and tour, she utilizes her newly discovered voice and wealth to turn the tables. Middendorf has the less flashy part but beautifully inhabits a woman who maintains courage and grace while enduring so much in the first half, but is equally believable when she becomes a fearsome woman fueled by righteous anger. As a feminist in this century, it was a difficult reminder at times to witness how little opportunity there was for these women of the late 19th century and how dependent they were on men for self esteem and survival. It’s a puzzling shame that a play which celebrates female intimacy and empowerment has rarely been staged and instead fallen into semi-obscurity. Henley and her drama make a spirited and welcome return to the New York boards.